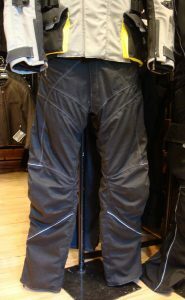 Last month I started the process of getting some bespoke made to measure Hi Pro textile trousers from Hideout Leathers. This week they were ready for a trial fitting, where I could try on a early first cut to test for size and see what further tweaks are required. It was great to see the trousers taking shape, check out the make up of the layers and get a good feel for what they’ll be like. And they felt hot! The trial fitting was of course with the thermal liner in situ to ensure it’s not too snug, which with the current heatwave we’re experiencing was very toasty. I had to put current temperatures aside and think ahead for when I’d be wearing these trousers in the cold, wet autumn and winter months. For the trial fitting I wore the same base layers and boots I’d expect to wear with them, to confirm they fit over fine. I also had to perch on my bike to ensure the knee armour was positioned correctly and I had enough length to avoid the hem riding up (a big issue with my current Rukka trousers). Throughout which, Kate and her team from Hideout checked all measurements and marked any final alterations required. Next, my trousers will be finished off over the coming 3-4 weeks, including having the outer layer sent away to a specialist company for bonding the waterproof layer in. Can’t wait for the finished trousers, it’ll be quite the novelty to have something quality to protect me from the elements and also fits perfectly! Read my full review after receiving the finally finished Hi-Pro trouser here.